My orthopedic practice exists since 1993 and has conservative focuses. The operations take place for outdoor patients at Iatros Klinik, Nymphenburgerstr. 1. Following my studies in Mainz and Munich, I was engaged in my education and training in orthopedics at Aukammklinik Wiesbaden and Orthopaedic Universitätsklinik Friedrichsheim Frankfurt. 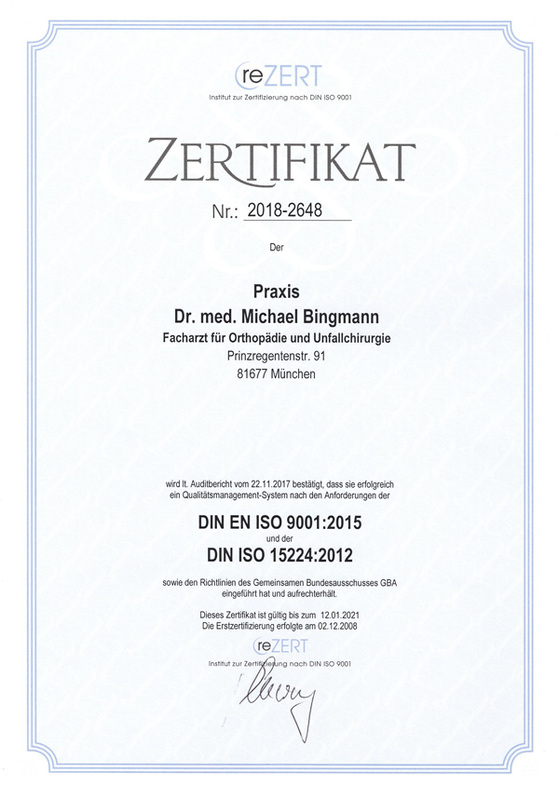 In Frankfurt am Main I obtained my approbation to practice as a specialist in orthopedics, as well as the recognition to specialize in Rheumatics. In addition, I completed a specialization in Sports Traumatology. I was subsequently employed as a senior doctor at the Sportklinik Stuttgart, supporting Prof. Steinbrück and Prof. Habermeyer. At this specialized clinic for sports injuries I was able to gain a greater depth of knowledge with regard to knee and shoulder surgery. the Society of German Rheumatologists. My orthopedic practice opened in central Munich at Prinzregentenstrasse 54 in 1993. 2017 we moved to Prinzregentenstraße 91. Since July 2006, my service has also expanded to south of Munich. At Gründwald you find our second practice. The entrance you find at Luitpoltweg. An ideal place and easy to get there. No parking fees at parking lots in Schlossstrasse and Rathausstrasse. For public transport use tram line 25 to final station (Derbolfinger Platz Grünwald). Walk on for 50 meters straight ahead and you reach the entrance of the practice. The Bavarian Medical Association’s professional code of conduct is accessible at www.blaek.de.